Preparation: paediatric exam | European Respiratory Society . is delivered only in English. To see details regarding the different types of MCQs used in the examination and how to use your examination booklet and answer sheet, check Parts B and C of our Preparation guidebook. The examination is designed using the consensus-based European syllabus in respiratory medicine, published in Breathe. The questions selected for the examination are mapped to the examination blueprint. This blueprint shows all topics covered in the examination and the average percentage of questions devoted to each of these topics. This examination blueprint has been updated in September 2016. Most of the questions are associated with a topic from both dimensions. As part of the examination results, you will receive a letter showing your subscores for each topic. View a sample letter. The following ERS sources are recommended for your examination preparation. This list should serve as general guidance only. Candidates should seek other sources for up-to-date information. The examinations strive to illustrate the current best practices in respiratory medicine. Current guidelines are therefore the basis of the questions in patient management, whether in differential diagnosis, diagnostic procedures, therapy, etc. This handbook offers concise summaries of each of the key areas of paediatric respiratory medicine. This reference is a key resource for the examination committee and an important tool for those preparing to take the examination in paediatric respiratory medicine. 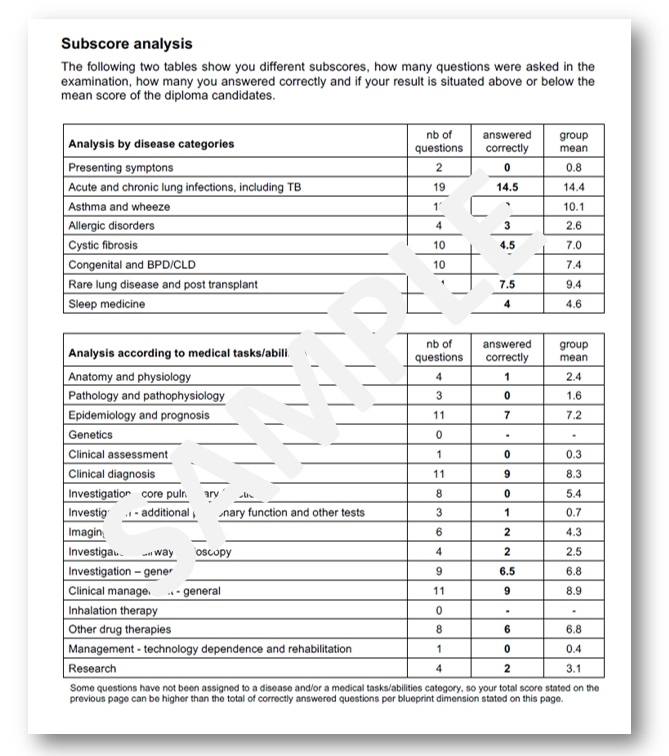 Although focused on adult respiratory medicine, this is a useful tool for those who want to get a feel of the multiple-choice question format used in the ERS HERMES examinations. The 261 multiple-choice questions cover the full breadth of respiratory medicine, using clinical vignettes that test not only readers' knowledge but their ability to apply it in daily practice. The annual ERS Summer School is intended to provide a comprehensive overview of each of the major fields of paediatric respiratory medicine. The programme is designed to challenge participants and provide a learning framework including interactive sessions and MCQ discussion sessions. The next ERS Summer School will take place on 12–15 June, 2019 in Barcelona, Spain. This course offers a ‘real-life’ clinical focus and efficient testing method. It is a 3-hour course featuring a 1 hour exam with 30 multiple-choice questions that are selected from the ERS HERMES examination question bank and a 2 hour feedback session with an ERS expert. This course is an ideal preparation for candidates wishing to sit the HERMES examination. The online test gives candidates a chance to get used to the multiple-choice format used in the examination. The 30 multiple choice questions (MCQs) should aid in the preparation for the exam. Please access the online test by using Google Chrome web browser. Mentorship is available for those sitting the European Diploma examination in paediatric respiratory medicine. Registered candidates will have the opportunity to receive guidance on taking the examination and find out more about the positive impact that taking the ERS HERMES examination can have. Candidates must register and finalise their payment by 15 June, 2019 at the latest in order to obtain a mentor. Do you want to become a mentor for future candidates? During exam registration, tick off the box “Become a mentor”. If you pass the European Diploma category examination, we will put you on a list of available mentors for the upcoming ERS HERMES examinations. Approximately two weeks before the examination date, you will receive an invitation letter with a voucher (in pdf) via email, which enables you to enter the Congress centre and examination room. It also includes your unique seat number. A seating chart will be provided as well, so you can find your seat quickly. We ask you to leave all other personal belongings (bags, smartphones, wallets, keys, food, drinks etc.) at your accommodation, or in the main Congress cloakroom free of charge. A small makeshift drop-off place will be placed within the examination room and observed by an assistant, but we cannot take responsibility for the security of these items. Pencils, erasers and a water bottle for each candidate will be provided on site. For more details and onsite regulations, see Parts F and G of our Preparation guidebook. Please be aware that by signing the register on site, you agree to adhere to these regulations.